Last year's Classic Course winner Ryan Herhusky (center) and Luca Robillard (right) look to track down Michael Medina during the Great Trail Race. This year's race will be held Sunday, Oct. 7. The third annual Great Trail Race returns on Sunday, Oct. 7, and will feature more than 200 athletes competing in mountain bike and trail racing in local race organizer Big Blue Adventure’s final event of the 2018 season. Registration for the event is $80 if done online by Oct. 6, and increases by $10 for onsite registration. There are also options for team racing. For more information visit GreatTrailRace.com. 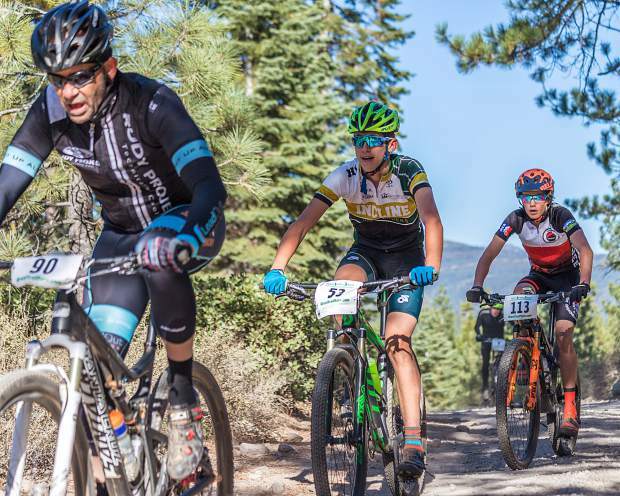 Following the Great Trail Race, Big Blue Adventure will close out a racing season that, according to Director of Operations Bryan Rickards, has seen the organizers reach maxed out fields of athletes in three different events during this past racing season. The race is among the final opportunities for competition before the winter season arrives. Athletes will have another chance to race before the snow hits, with Tahoe Blue Vodka’s Lake Tahoe Marathon on Oct. 12-14.